The first question Josh Fuentes gets asked in every interview is not about the young third baseman himself. It's always about another third baseman who happens to be his cousin. "Every time I've started an interview since Rookie ball, it's always, 'What's it like being Nolan's cousin?'" said Fuentes, who is related to Colorado Rockies All-Star Nolan Arenado. "It's fine, it's not a big deal. I embrace it. Obviously it's awesome he's my cousin. "I'm in Triple-A [now]. It might be nice for people to recognize me as Josh Fuentes." Fuentes, who is now playing for the Triple-A Albuquerque Isotopes, is doing his best to get noticed for his own accomplishments. The 25-year-old hit .307/.352/.517 with 15 home runs and 72 RBIs last season at Double-A Hartford and has gotten off to a strong start this year, batting .364/.408/.477 in his first 11 games. "He's a young kid that can hit and he can defend," Isotopes manager Glenallen Hill said. "Most younger players have to go through a period of time where they feel like they belong. With Josh, it's just a matter of him going out there and competing. Whether it's here or in the big leagues, they still play the same game and he just needs to focus on doing what he does ... he can hit and he can definitely defend." 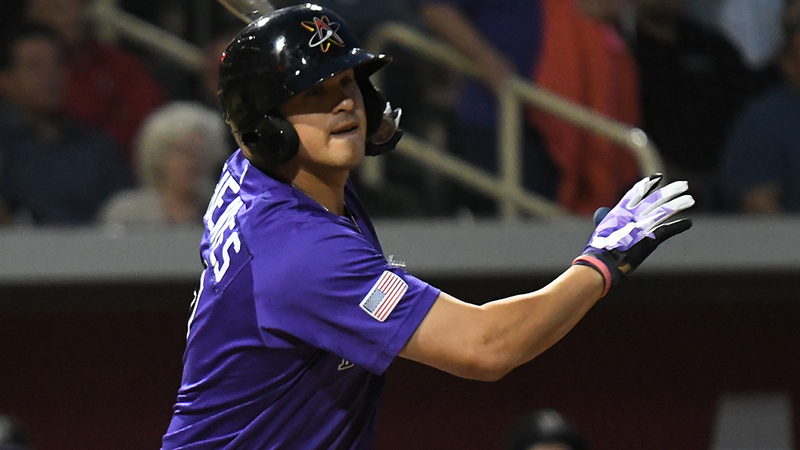 Fuentes started the year just 2-for-17 on the road, but since coming to Albuquerque he has four multi-hit games in his first five contests at Isotopes Park. That is a carryover from his second half with Hartford, when he hit a remarkable .438/.471/.753 in 41 games. "I took some days off at the All-Star break and came back with the mentality of be aggressive, be myself," Fuentes said. "I think that worked, just getting up there and swinging at pitches I knew I could hit. It's really a no-fear concept, just be aggressive, have no fear of striking out." So far this season, Fuentes said he has been making sure to take in a lot of information from the experienced group of teammates he has with Albuquerque. "Most everything we do in the clubhouse, I'm just trying to gain information from them," Fuentes said. "I don't want to be the guy who thinks he's got it figured out because he had a good year in Double-A. I'm listening to guys like [Tom] Murphy and [Noel] Cuevas and [Raimel] Tapia. … It's huge for me to listen to what they have to say." Fuentes said he does keep in touch with his older cousin in the Majors and Nolan's younger brother Jonah, a prospect in the San Francisco Giants' system, throughout the season. "We have a little group text -- me, Jonah and Nolan," Fuentes said. "If Nolan sees one of us struggling for a long time, he'll text us, see what's going on. If we go on a tear, he'll go, 'Hey, man, keep it up.' The funniest thing is when someone hits a homer, like the other day Jonah hit a grand slam against the Yard Goats, and so he sent us the video. 'Look what I did to the Rockies!'" For now, Fuentes will focus on himself, just one call from joining Nolan Arenado in Denver. "I'm just trying to play well and show the Rockies I can play at the big league level," Fuentes said. "I've got a chance and I've got to take advantage of it." Tucker trucks on: Fuentes is not the only PCL player with a relative in the big leagues. Fresno outfielder Kyle Tucker, the younger brother of Atlanta's Preston Tucker, is off to a solid start, batting .300/.404/.450 with a home run and eight RBIs through 10 games. The younger Tucker is the 16th-ranked prospect in the Minors. Big Mac attack: The hottest hitter in the league early on is Sacramento outfielder Mac Williamson. The slugger has hit .500/.611/1.143 with five home runs and 13 RBI through eight games and was named PCL Player of the Week on Monday. Fountain of youth, Memphis-style: Redbirds right-hander Daniel Poncedeleon, who missed most of last season after being struck in the head by a line drive, is back on the mound and back in form. The Cardinals' farmhand has allowed just one run through 11 innings, striking out 17 batters. Chris Jackson is a contributor to MiLB.com. This story was not subject to the approval of the National Association of Professional Baseball Leagues or its clubs.